Many of us continue to hold onto the notion that most robots are large, rigid machines that stay in one place and perform one repetitive task. But the landscape of robotics is changing, and quickly. 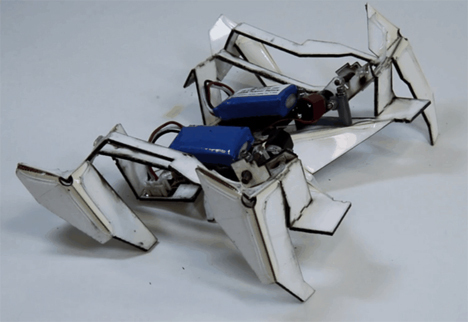 A team of researchers from MIT and Harvard came together to produce a truly impressive prototype robot that is not only small and lithe – it assembles itself, origami-style, before scuttling off. 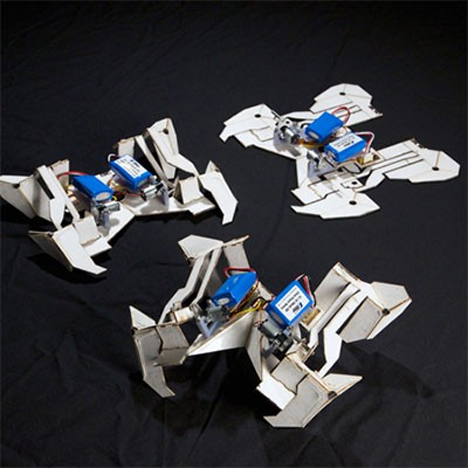 The origami robots project has been ongoing for a number of years. The researchers were inspired by the way nature seems to use carefully orchestrated folding and unfolding to make near-magic happen every day. 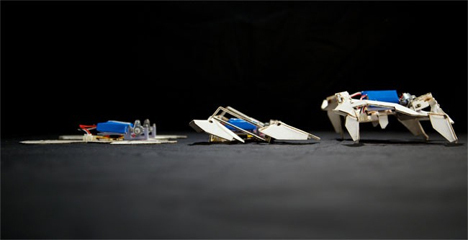 They applied the same folding ideas to robots and have developed several that start out flat but self-assemble by folding in strategic ways. Until now, however, all of their self-assembling ‘bots required some type of human intervention before they could carry out their designated function. Whether it was a crucial fold or simply clicking on a power switch, none of the robots could truly function on their own. The new prototype is composed of five layers: a copper center laser-etched into an array of electrical leads, two layers of structural paper, and an exterior made of a polymer that folds and holds its shape when heated. Almost all of the robot was fabricated using an ink printer and a laser machine. Hinges in the robot’s body – each equipped with an embedded circuit – are programmed to bend to a certain degree when heated. The robot also contains two motors, two batteries, and a microcontroller. The robot begins self-assembling ten seconds after a battery is installed, an action that is controlled via an integrated timer. But the research team says that the assembly could be activated by a number of environmental conditions like temperature or pressure. 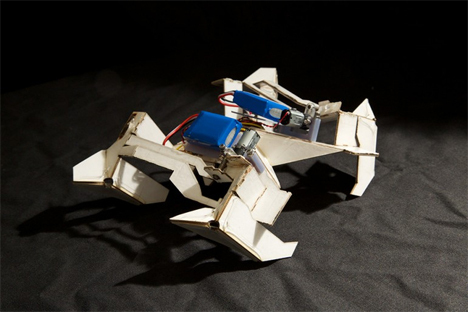 After the robot folds, bends, and pops into the third dimension, it automatically scuttles away. Future generations of the self-assembling robot prototype could be used to furnish made-to-order household machines, perform searches in hard-to-reach areas, or even to send lightweight, inexpensive, pop-up satellites into space.